As you’ll have gathered from my last post, I’ve been making a steel string guitar recently. That’s something I hadn’t done for a long time, and it got me thinking about truss rods. One puzzle is how they got their name. 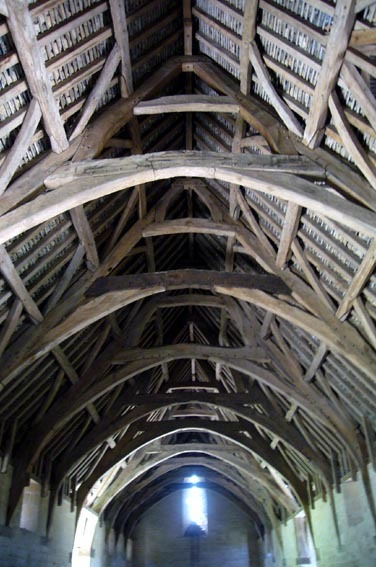 Doesn’t the word truss conjure up something like the Forth bridge or the roof structure of this magnificent medieval tithe barn¹? Wikipedia says that, used in an engineering context, a truss is a structure comprising one or more triangular units constructed with straight members whose ends are connected at joints referred to as nodes. So it’s surely an exaggeration to call a rod in the neck of a guitar a truss. Still, it’s not seriously misleading and I expect that most readers will think I’m quibbling. Another puzzle surrounds the purpose they serve. As far as I know, no classical guitar maker finds them necessary. So why is it that steel string guitar makers never build a guitar without one? The straightforward answer is that steel strings exert more tension when tuned up to pitch than nylon strings and that a truss rod is necessary to counteract this extra force. But I wondered if this explanation really held water. Using information provided by d’Addario, a reasonable estimate of the combined tension of 6 nylon guitar strings is about 40 kgs, while 6 steel strings exert nearly double that at 70kg. A load of 70 kgs certainly sounds a lot – the weight of an adult man – but don’t forget that it’s acting at a mechanical disadvantage when it comes to bending or breaking the neck of a guitar. The pull is only a few degrees away from parallel to the neck’s longitudinal axis and the compressive forces will be substantially greater than the bending forces. The answer turned out to be that, tuned up to pitch, string tension would deflect the nut end of the neck about 1.6 mm forwards of its unloaded position. Although this is bound to be an over-estimate (because the calculation neglected the stiffening effect of the fingerboard and the increasing dimensions of the neck as it descends), I was surprised how large the deflection was. And I wondered if I’d got something seriously wrong. 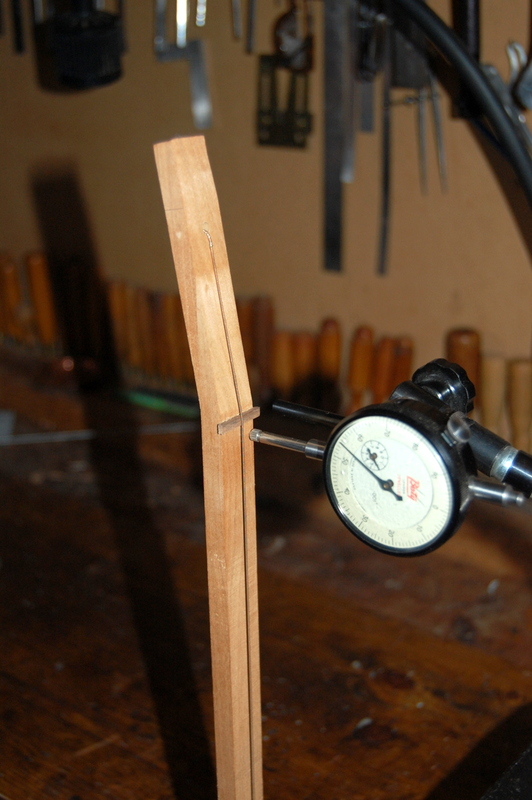 To check, I made a primitive model of a guitar neck to make some actual measurements. As you can see in the photographs below, the experimental neck is smaller in cross section than a real neck but it’s modelled realistically with an angled headstock and nut. 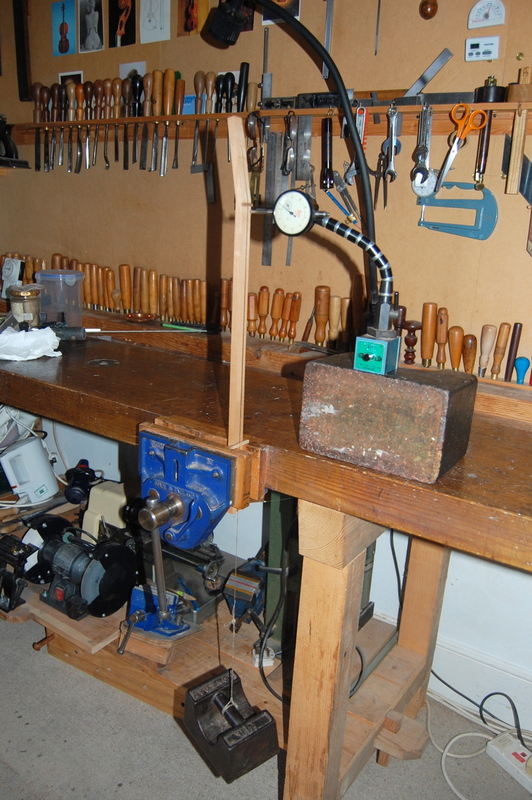 Loaded with a 14lb weight, I measured a deflection of 1.47 mm at the nut, which compared fairly well with a theoretical value of 1.26mm derived using the dimensions of the model neck. So I’m moderately confident that my calculations for a real guitar neck aren’t too far out. It looks as if the obvious answer is at least partly right. You almost certainly do need a truss rod to counteract the bending effect of string tension on the neck of a steel string guitar. I suspect there’s another reason for truss rods too, and that is to prevent creep. Wood that bears a constant load for a long period tends to deform gradually even when the load is far short of its breaking strain. This is the reason why the ridges of old roofs tend to sag in the middle. In his book, Structures, J E Gordon explains that it’s also the reason why the Ancient Greeks took the wheels off their chariots at night. The wheels were lightly built with only 4 spokes and a thin wooden rim. If left standing still for too long, the wheels became elliptical in shape. So perhaps I’ve ended up proving something that most guitar makers knew already. However, I don’t feel that the exercise has been a complete waste of time. Musical instruments shouldn’t contain anything that isn’t either necessary or beautiful. Since truss rods certainly don’t fit into the latter category, it’s good to know that they qualify for the former. 1. Thanks to Kirsty Hall for the image of the tithe barn. 2. Details of calculation of neck deflection. To work out the area moment of inertia, I assumed that the neck was semi-elliptical in cross section and that the neutral axis ran through the centroid. Modulus of elasticity of the neck was taken as 10,000 MPa. Deflection was calculated as Ml²/2EI, where M = moment exerted by strings at the nut, l = length of neck to neck/body join, E = modulus of elasticity of material of neck (taken as 10,000 Mpa) and I = area moment of inertia of neck (assumed to be a half ellipse).